One week ago, as General Conference officials gathered in Maryland to conduct the annual business meeting of the church under the banner of revival and reform, I found myself traveling along winding roads through the rugged, mountainous region near Lake Kivu, Rwanda. It was a personal pilgrimage of sorts, inspired in part by a concern I have had for some years to confront what happened to approximately 3,000 men, women, and children as they crowded the Seventh-day Adventist mission compound in Mugonero on a Sabbath morning in April, 1994. A few days earlier, Rwanda’s President Habyarimana and most of his top advisors were killed when their plane was shot down over the presidential mansion in Kigali. Hutu soldiers and civilians—who had been avidly marking the signs of the times—immediately began the systematic genocide of all members of the Tutsi tribe in the country. Within three days, an estimated 20,000 Rwandan Tutsis were dead. Within a hundred days, that number had reached more than 800,000, most slain by machetes imported specifically for the extermination. It was the fastest and most efficient killing spree in the twentieth century: the dead accumulated in Rwanda three times faster than the rate of Jewish dead during the Holocaust. Yet Rwanda at the time was one of the world’s most Christian nations. Over 90 percent of the population were professing believers. In fact, with more than 10 percent of the entire population being baptized Seventh-day Adventists, church leaders described Rwanda as the most Adventist country in the world. And this is why the 3,000 had fled to Mugonero. According to journalists and human rights investigators, Pastor Elizaphan Ntakirutimana, a Hutu and then president of the Seventh-day Adventist church in the Kibuye region, urged Tutsi members of his congregation, as well as others, to take shelter in the Mugonero Adventist compound. Many also came without prompting from the surrounding bush, avoiding countless militia checkpoints in a harrowing flight for refuge on the Adventist property. The answer to this plea came the next day, Sabbath morning, at approximately 9 o’clock am. 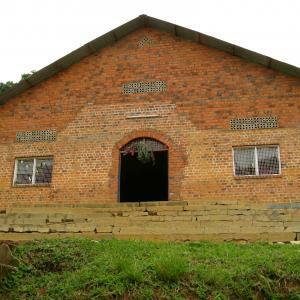 The attackers advanced toward the church from all sides chanting “Eliminate the Tutsis!” They worked methodically with guns and machetes, moving from church to school to hospital. The victims, weak from food and water deprivation, mounted a feeble defense with bricks and stones. But they were overcome with little effort. The killers, keen to spare bullets, only paused when the physical exertion of chopping and spearing demanded rest. By evening, mop-up operations had begun: tear gas was fired to cause any living Tutsis among the corpses to cry out. The attackers then made sure these joined the rest. In the end, Mugonero may have been the worst single massacre in the entire 1994 genocide. In a single day almost all of the 3,000 Tutsis who had gathered at the Adventist mission were slain, some 2,000 inside the Seventh-day Adventist church building itself. The bloodstains were no longer visible on the walls and floor when I visited Mugonero one week ago. The church is in fact still being used as an active place of worship. Near the entrance to the Mugonero high school there is, however, a small building with stacks of machete-hacked skulls as a memorial to what happened here more than 15 years ago. Several months after the attack, in a short interview published in the Review, J. J. Nortey, then president of the African-Indian Ocean Division, said that as many as 99 percent of all Adventist workers in the Mugonero region—among them pastors, hospital personnel, and mission employees—were killed. In total, an estimated 10,000 Seventh-day Adventists died in Rwanda in barely three months. Even more alarming in the aftermath of the genocide, however, is the fact that Adventists were not only among the victims. On February 19, 2003, Pastor Ntakirutimana was sentenced by the International Criminal Tribunal for Rwanda to 10 years in prison for complicity in crimes against humanity. The Tribunal found that Pastor Ntakirutimana, together with his son Gerard—the head doctor at the Adventist Mugonero Hospital—aided and abetted Hutu killers, going so far as to order the removal of church roofing so that Tutsis would have nowhere to hide. But the Ntakirutimanas were not the only Adventists who sided with the killers. In regions with large numbers of Seventh-day Adventists, the killings were just as bad as in the rest of the country. “[T]here were church-going people seen in the mobs, cheering…those who did the killings,” Nortey reported. Today, jails in Rwanda hold large numbers of Adventists who have been implicated in the genocide. According to one high level church official I spoke with at the Union office in Kigali, not only Adventist lay members but numerous Adventist pastors have been convicted by Rwanda’s village level gacaca courts for their role in genocidal crimes against humanity. During the genocide, he told me, some Adventists maintained their Adventism by scrupulously resting from killing on Sabbaths. These are uncomfortable facts that most of us would prefer to avoid. But Rwanda raises questions that must not be lightly dismissed by those seeking a true revival and reform of the church. Are we in no way implicated, we must ask, by what happened in Mugonero? Has our response been commensurate with the crime? What are we to do with the fact that the genocide was committed by our brothers and sisters in the faith—by individuals no different in their religious beliefs and practices than millions of other Adventists in Africa and around the world? And have we stopped to think about what Rwanda might mean for Adventism as a whole—for the way we proclaim the Gospel and for the Gospel we proclaim? As a child growing up to missionary parents in Zimbabwe, I recall attending an evangelistic series over several weeks that attracted thousands of persons each night. The campaign was based on one understanding of Adventist eschatology and the book of Revelation. The speaker, a prominent Adventist televangelist known for his ability to generate mass baptisms, unfolded in great detail the doctrine of the sanctuary, the importance of the Sabbath, the gift of prophecy, and the relationship between these truths and end-time events. His style was assertive and self-confident, employing sophisticated visual aids to enhance his frontal assault on doctrinal error. Soon his campaign drew the attention of the local newspapers, which depicted him in one editorial cartoon swinging his microphone as a weapon in combat with the local Catholic bishop, whose staff was raised in self-defense. As a child, I must confess that I found all of this rather thrilling. How good to be on the side of Truth! Today, I cannot say I am so thrilled by the memory of that high profile evangelistic campaign that culminated in several days of baptisms of thousands into the Adventist "tribe". The reason for my unease is reflected in an article published in 2001 in Sette (a major Italian weekly magazine). The story, later republished in his 2004 book, War, Evil, and the End of History, was written by a prominent French intellectual and journalist, Bernard-Henry Levý. Its title was “Burundi Dies Every Day Except on Sabbath”. The statement may be an exaggeration, or even a gross distortion of fact (some church leaders I have spoken with believe it is no more than this). Yet the article cannot be dismissed as a pure anomaly. The PanAfrican News Agency around the same time period reported that some FNL rebels in Burundi, claiming to be members of the Adventist church, mount attacks while singing religious songs, bibles gripped in one hand, guns in the other. Could it be, these reports force us to ask, that there are in fact significant numbers of individuals in some parts of the world who count themselves Adventists—who have somehow glimpsed many distinctive Adventist doctrines: the Sabbath, the Second Coming, the health message—but who have not discovered that at the heart of Adventism lie the weightier matters of the covenant: faith, justice, and mercy? Could it be there are persons who have been introduced to the church through images of Adventists and Catholics in the grips of religious combat, but have who never met the Jesus of scripture—the Jesus who refused the path of violence in the face of injustice and oppression and who conquered not through political maneuvering, techniques of mass-media evangelism, or bureaucratic power plays, but through powerless suffering at the hands of his enemies? Could it even be there are some Adventists who know the sanctuary doctrine and all of the other fundamental beliefs well, yet who have forgotten that the church must above all be a sanctuary to all who are oppressed and downtrodden? Rwanda and Mugonero raise other perplexing questions for Adventists as well. The narrative we have long told about ourselves is that in a final apocalyptic moment in history we alone will stand for the right though the heavens fall. But in Rwanda the apocalypse came. The heavens fell in 1994. And Adventists in Rwanda collectively behaved no differently than any one else. Meanwhile, the faithful in North America have continued on as if nothing happened. Ten thousand of our brothers and sisters were slaughtered…and all was and is business as usual. The treasurer of the Rwanda Union, Abel Habiyambere, himself a survivor of the genocide, told me that he has compiled a long list of names of Adventist employees who were slain during the genocide and that he has tried to raise awareness of what happened to the church in Rwanda among Division and General Conference officials. So far, he says, they have shown little interest in his list, despite—or perhaps because of—the distressing Adventist connections. So what, we must ask, is the meaning of this corporate and willful amnesia? Would there be such great silence and so little introspection had 3,000 Adventists been killed with machetes in Loma Linda University Church on a Sabbath morning, including by their fellow Adventists? After World War II, Jewish theologians were compelled to develop a post-holocaust theology in response to the catastrophe that had befallen their community and humanity. But fifteen years after the apocalypse came to Rwanda—the most Adventist country in the world by membership relative to population size—there is no post-Rwanda theology to be found among the Remnant people. There is no alteration or even tempering of our heroic self-understanding—only the insistent demand that we recommit ourselves to the familiar narrative without question. This, we are told, is "revival and reform." Yet there have been a few fleeting moments of soul-searching among Adventists. In 1996 the Review published an excerpt from a sermon given by then President of the General Conference, Robert Folkenberg, to hundreds of Adventists gathered in Kigali. His message is a powerful statement that has not received the attention or reflection it deserves but that may contain the seeds of a profound and authentic revival and reformation of the church, even if in ways Folkenberg himself did not fully realize or intend. I am thankful that a top church leader said these things, and that he said them not simply about others but about himself. There are no easy answers in this anguished testimony, but in confronting the reality of Rwanda we might discover a more faithful witness in painful questions than in detached certainties.